ABC Carpet & Home: The high-end home goods store is offering 20% off rugs and carpets, furniture, lighting, bedding, bathroom accessories, and mirrors online and in-store between Tuesday, November 22, and Monday, November 28. Use promo code GRATEFUL. All Modern: As of November 18, All Modern is offering up to 70% off furniture and home accessories, organized by room. They are also offering special Thanksgiving prices on-site, in addition to Black Friday deals. Amara Home: Beginning on November 25 at 9 a.m. EST, Amara Home will be offering up to 50% off all luxury brands. Sale ends November 28 at 11:59 p.m. EST. Amazon: The e-commerce magnate is offering Black Friday Deals of the Day, adding new items for up to 75% off every 5 minutes. Deals are expected to get even better come Cyber Monday. Anthropologie: Our go-to for last-minute holiday gifts, Anthropologie is offering 20% to 25% off all full-price items (plus additional off sale items)—excluding Found and Bhldn brands. ATG Stores: From now until November 23, the home furnishings site is offering 10% off selected items using promo code HARVEST10. Check back on Thursday, November 24, for the Black Friday deals, lasting through Sunday, November 27. Barneys: On Black Friday, Barneys New York will be offering 40% off sitewide. Markdowns will increase to up to 60% off sometime in December and eventually reach 75%. Add them to your bookmarks! Bloomingdale’s: From now until November 23, Bloomingdale’s is offering $25 off every $200 spent on selected items online. You can also scoop up a designer handbag for 30% off, now until November 28. Free shipping included! Brooklinen: Brooklyn-based Brooklinen is offering free shipping sitewide, 10% savings on $250, 15% savings on $350, and 20% savings on $450 now until November 29. Chasing Paper: Save 50% on selected wallpapers beginning on November 25 and ending on November 28. Free shipping included! Horchow: Use code HOLIDAY between November 23 at 5 p.m. and November 27 at 10 p.m. for 20% to 40% off selected items. IKEA: Head to IKEA’s U.S. website for a $25 off coupon on a purchase of $150 or more, valid through Christmas Day. On Black Friday only, enjoy 25% off the Swedish Food Market items with an in-store purchase of $100 or more, before tax. Joss & Main: Sales up to 70% off are starting now. Plus, free shipping on all orders over $49. Lulu & Georgia: From November 25 to November 28, shoppers can enjoy 15% off orders of $250 and more with promo code BLACKFRIYAY15, 20% off $500 or more with BLACKFRIYAY20, and 25% off $1000 or more with BLACKFRIYAY25. Overstock: On Wednesday, November 23, enjoy 30% off electronics, up to 60% off home goods, up to 30% off toys, up to 70% off jewelry and watches, and up to 40% off furniture. Parachute: From Friday, November 15, to Monday, November 28, enjoy 15% off everything in-store. 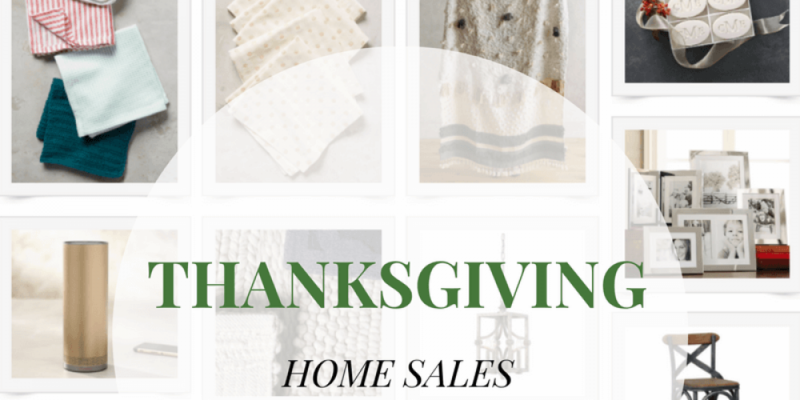 Rebecca Atwood: Enjoy 20% off all orders over $100 from November 25 to November 28 using promo code GIVETHANKS20. Shopbop Home: Beginning tomorrow, November 22, through November 28, take 15% off $200, 20% off $500, and 25% off $800. Target: From now until November 28, shop Target’s 10 Days of Deals sale in-store and online. Specials cover beauty, kitchen, apparel and accessories, holiday décor, and more. West Elm: Now through November 28, get 15% off $100 or more, 20% off $500 or more, 25% off $1000 or more, and 30% $3000 or more. Williams-Sonoma: On November 28 and November 29, enjoy 10% off $50 or more, 15% off $100 or more, 20% off $200 or more, and 25% off $500 or more.